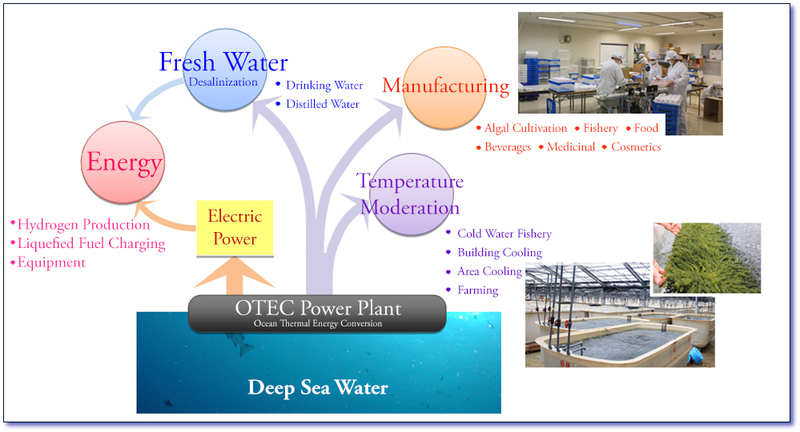 Since deep seawater maintains its low temperature (10-12 degrees Celsius) and unique mineral properties after use in OTEC power generation, the water can be used in agriculture, industry, cooling, and other fields. Research continues into multiple uses of the water, opening new ways to harness the resources and energy of the sea. During the initial phase of testing we did not reutilize seawater after power generation, but in the next stages of OTEC development in Japan we hope to increase efficiency and cost effectiveness through implementation of the "Kumejima Model." To this end, two projects now utilize post-OTEC deep seawater in their experimentation. OTEC's only output is clean cold water- A vital resource for communities in the subtropical areas where OTEC is most viable. Over the past 17 years+ researchers at the 15 sites around Japan have been researching the properties and uses of Deep Seawater. On Kumejima there are 18 companies harnessing deep sea water for use in various products. Find out more below. Kume Island grows winter vegetables in the summer with the help of cold deep seawater! Expansion of the DSW agriculture facilities is underway next to the Research Center. Kuruma Prawns are the prized shrimp sold live throughout Japan. 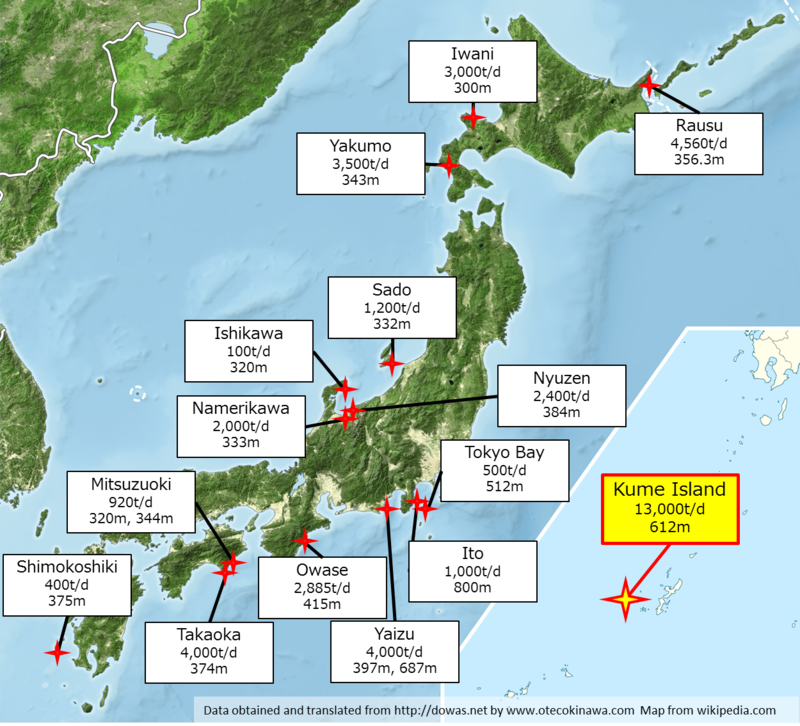 Four prawn farms and the Okinawa Prawn Hatchery grow Kume Island Kuruma Prawns. Bade Haus is a local spa and pool that uses 100% deep seawater to provide a relaxing and enjoyable experience. Explore the mineral rich waters in the soothing pools. Kume Island's Point Pyuru is a cosmetics company specializing in products created from deep seawater. It produces both its own brands and operates as an OEM producer. Sea Grapes, also known as Umi Budo are a high-end sea plant that is popular in Okinawa and surrounding countries. Sea Grapes depend on temperature controlled production which is provided by deep seawater. Salt, Bottled Water, and Nigari are made from deep seawater on Kume Island. Since Deep seawater is cleaner than surface sea water it is easier to create bacteria and contaminant free seawater based products while keeping the useful minerals found in the deep sea. What uses the most power in the summer months? Air conditioning uses a lot of natural resources. Using cold deep sea water to cool buildings can reduce the demand for electricity. Large buildings (such as hotels) or nearby industries can use deep seawater to cool rather than draw power for cooling. 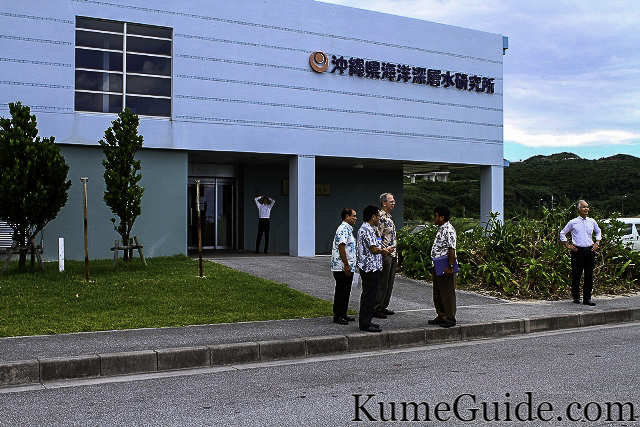 On Kume Island, the Deep Sea Water Research Institute uses a heat exhanger to cool water that runs through a system which cools the entire labratory building. This small-scale use is just one of many places around the world that utilize cold water from deep lakes or oceans to cool buildings. Efficient use of resources is critical to maintaining the balance between cost and benefit. Many uses of Deep Sea Water are not mutually exclusive. Planned correctly, OTEC and DSW industries can be developed in cascade to utilize the same water as much as possible. Continuous communication between interested parties in both industry, government, and power is critical to the efficient development of OTEC for world use.